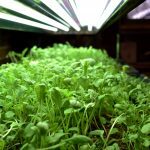 The term microgreens refers to a variety of edible immature greens, in what is traditionally considered to be the first stage of plant growth. To grow ours successfully, we put them under fluorescent lights for 10 hours per day. They are usually harvested less than a month after seed germination, when the plants are only 1-3 inches tall. 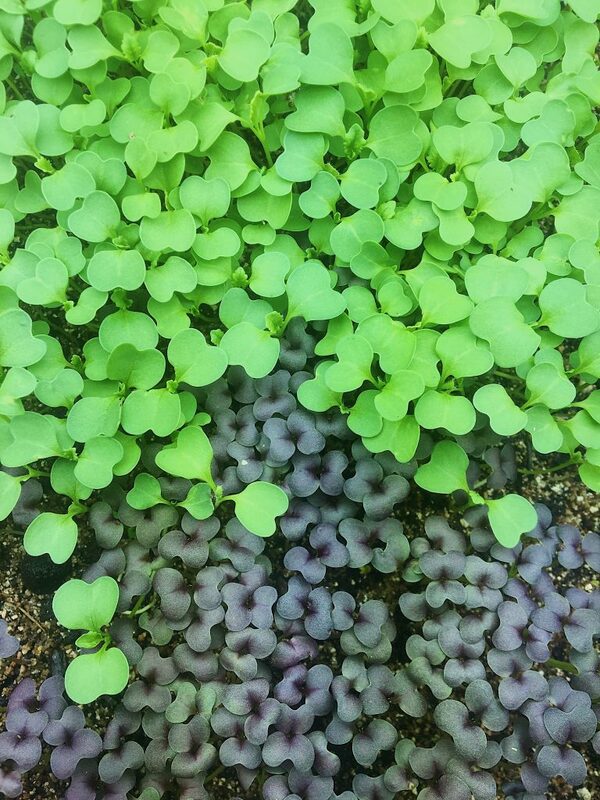 You can harvest microgreens any time beginning from their cotyledon (seed leaf) stage to their “true leaf” stage. Microgreens have a much more intense flavor profile than mature greens do, and they are often more densely concentrated with nutrients. In addition to new flavors, they can add vibrant color and textural contrast to any dish! 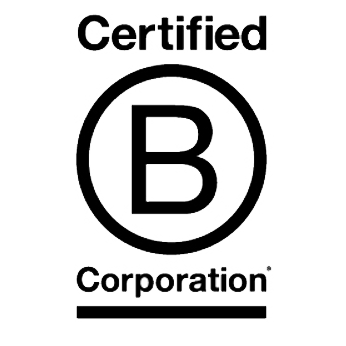 Green City Growers (GCG) employs the best organic practices so we can help you grow your own successful microgreens. Our newly designed and developed microgreen system is perfect for schools or restaurants. It consists of a chrome metal indoor growing system with all inputs included. It is a fours shelf system with prismatic lighting panels and humidity domes. We install reservoir irrigation systems with a pump, and provide capillary mats, seeds and growing media, grow lights and grow trays. Work with GCG’s consult and design team to develop a microgreen system that works best for your needs. We will work with you to determine the best strategy for growing the amount of microgreens you want within the growing space available. GCG’s professional farmers will maintain your microgreen system, so your establishment has access to nutrient dense microgreens at all times! Microgreens can be grown indoors on a window sill with a shallow container and some soil, as long as they get 4 to 6 hours of natural sunlight per day. This is a great option for urban gardeners who have limited space. Microgreens only have a few days of “shelf life,” so make sure to use them quickly!